The astronomer and physicist Galileo Galilei (1564 - 1642) is considered to be the father of modern science. Born in Pisa, Italy, he studied for the priesthood, left that path to study medicine to please his father, and then finally settled on mathematics. He was the first to discover the nature of pendulums, the knowledge of which was used in clocks. He improved on the primitive telescope, and supported Copernicus's theory that the earth revolved around the sun. That support eventually led to his conviction for heresy and decades of house arrest. Philosopher. Scientist. Heretic. All of these words describe the man who was arguably one of the most famous men of the 17th century and a central figure in the scientific revolution of that century, Galileo Galilei. Albert Einstein, the physicist whose work includes both the special and general theories of relativity, unified field theory, and the atomic bomb, called Galileo the "father of modern science," and Stephen Hawking has said that Galileo deserves more credit for the birth of modern science than anyone else. Galileo was born in Pisa, Italy in 1564 to a father who was a famous musician and music theorist as well as a wool trader. At the time of his birth, there was virtually no such thing as science. His family moved to Florence when he was eight, and there he began his formal education, and at the age of eleven, he entered a Jesuit monastery where he was inspired to aspire to the priesthood. He left the monastery at the age of seventeen for an education in medicine at the University of Pisa as his father wanted. He never obtained his medical degree, however, as he was sidetracked by mathematics. In 1609, he learned about a simple telescope which was built in the Netherlands by eyeglass makers who used their handmade lenses to make it. Galileo improved on it and sold several of his own to merchants in Venice who used them to spot ships. But he went on to improve upon it even more, and began to investigate the skies. The fascination he developed and his powerful telescope allowed him to confirm the phases of Venus, and to the discovery of four of the satellites of Jupiter, which are still called "Galilean moons". In his book about astronomy, "The Starry Messenger," he detailed his discovery that the moon is spherical, not flat as previously thought. He also wrote about the fact that Venus rotated around the sun. Because of these discoveries, he supported copernicanism -- which is the theory of astronomer Nicolaus Copernicus that the earth rotates on its axis and, with the other planets, revolves around the sun -- despite warnings from Pope Paul V that the idea that the earth revolves around the sun was "false and altogether opposed to Holy Scripture." In 1615, in fact, the Roman Inquisition investigated the concept, which is also called heliocentrism, and banned Galileo's written works -- including all those in the future -- as well as forbidding the scientist from advocating the theory. In response, he wrote "Dialogue Concerning the Two Chief World Systems," a defense of his position. 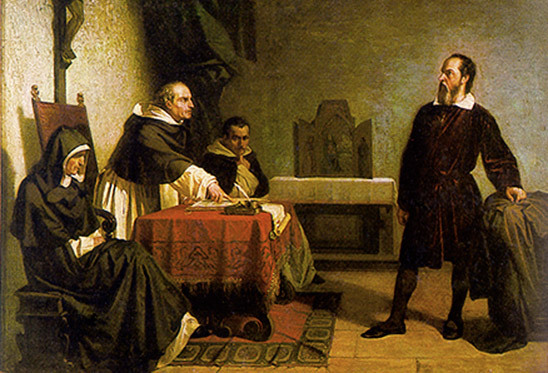 This piece seemed to attack the sitting Pope, Urban VIII, and in 1633, Galileo was found "vehemently suspect of heresy." He was forced to recant and spent the rest of his life under house arrest. He wrote one of his best and most expansive books, "Two New Sciences," during that confinement, though the ban on his works forced him to have them published in Holland, where the Inquisitions did not hold such sway as they did in Poland, France, and Germany, where no willing publisher could be found. This book dedicated one section to Aristotle's physics and mechanics and another to the science of motion, which are now known as kinematics and strength of materials. It was this work in which he first wrote about the law of falling bodies, bodies in motion, and infinity. Galileo Galilei died in 1642 after suffering palpitations and a high fever. He had been completely blind for four years, had insomnia, and was in near constant pain from a hernia. On October 31, 1992, Pope John Paul II apologized for the Catholic Church's treatment of Galileo. Sets forth details about the life and death of Galileo, as well as his struggles and inventions. Also digs into topics such as his theory about the tides, his experiments involving the speed at which light objects and heavy objects fall, and his work with pendulums. Delves into the life and discoveries of Galileo Galilei, including his astronomical findings and books, his inventions, and his struggle against the Catholic Church because of his adamant belief that the earth revolved against the sun. Presents the biography, chronology, and family of the father of the scientific revolution as well as a study of his fight with the church and his contributions to science. Search for Galileo on Google, Bing, or Yahoo!